In the case of bottle, we are reasonably certain of our courtly designation and attribution to the imperial glassworks. The design is related to examples in Duan stone from Guangdong province that are discussed under the most spectacular example known, in the J & J Collection (Moss, Graham, and Tsang 1993, no. 84, where a number of other examples are cited both in Duan stone and glass). Although we noted there the possibility of the design of the Duan examples being carved at Guangzhou, there seems little doubt now that the glass versions were carved at the court, perhaps providing the inspiration for what may be their southern counterparts. Glass bottles of this design are much more rare than would be suggested by the quantity in the Bloch Collection, but others known include a darker, more standard ruby-red example (Christie’s, New York, 3 June 1993, Lot 338), and the gorgeous bottle in turquoise-green splashed with red in the J & J Collection (op. cit., no. 368). Conspicuous by its absence, however, is any published example—so far—in imperial yellow. Here the imperial attribution is supported by both the ruby-red colour (derived from gold) and its presumed mixture with colourless glass. Since most of the examples in this particular range of glass possess strong courtly connections of some sort, including crizzling, palace octagonal forms and rope borders, and typically palace mask-and-ring handles, our attribution is further supported. Dating this group is easier than is the case with the Duan stone equivalents because of comparisons with other features of imperial glassmaking. The wide mouth here is a feature that we have proposed as an early one, and the mask-and-ring handles all have circular rings, some of which are quite small, which we have also suggested to have been a feature of earlier palace style. 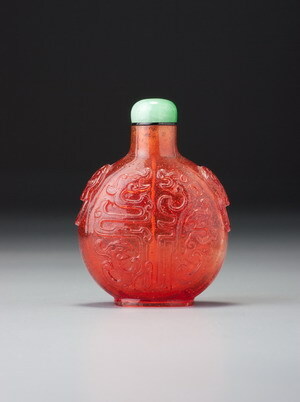 It seems likely, therefore, that these bottles were mostly made during the earlier part of the Qianlong period, although the design might have been occasionally repeated a little later. 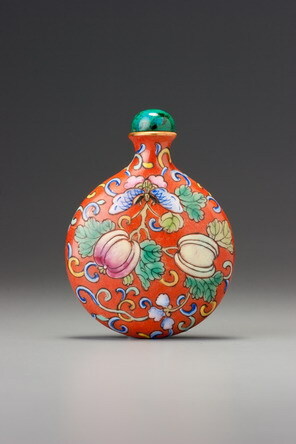 The consistently confident and masterly carving on the bottles in the Bloch and J & J Collections would also fit comfortably into the first half of the Qianlong period, when glassmaking seems to have reached its peak of perfection at court. We have only now noticed that the character on this bottle is reversed. A comparison with lot 66 in this sale, in which nearly the same exact design is carved in the normal orientation, will make this apparent. This kind of mirror-image reversal sometimes happened with coin bottles, but those involved foreign characters and motifs. It must be that the stylization of this character is so ornate that the mistake was not easily caught. We didn’t catch it until now, and if the design was new to the workers and inspectors, they should be excused—this time.